Parker's story is very different from Jordan's story, but it is still an excellent read. Parker is a girl who is trying desperately seperate herself from her mother's lifestyle and the rumors it sprouted about her. She's also trying to come to terms with her faith and dealing with a highly inappropriate crush on the new baseball coach. We get to see Parker's internal struggle with God and her need to know why things have happened to her and her family. I'm not a religious person and I don't typically read things that have religion incorporated, but it was done so well here and it never became preachy. It really helped the story, by showing the battle that was going on inside of Parker and even gave some insight into why she's made some of the choices she is now dealing with. I know it's totally cliche to jump right to talking about the guys, but I can't help myself. Firstly, Brian gave me creepy feelings the whole time I was reading and those didn't get any better when he proved to be a huge jerk. I felt for Parker because at her age, the kind of attention she was getting from him, would be so easy to make into something bigger. I could see the ending that Parker couldn't, and I just wanted to shake her and tell her to stop letting this guy take advantage of you. Will, on the other hand, is so many kinds of adorable. I love this boy to pieces and I really liked how their friendship evolved throughout the whole story. 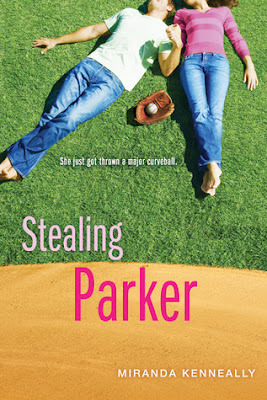 They've known each other for years, but they had always just kind of been on the outskirts of each other's lives, and that all changes when Parker starts managing the baseball team. I love how all her books are sports themed. I think we missed that in YA novels. Great review, I really can't wait to read it! I actually didn't realize she had a new book coming out, so now I'm super excited. This one seems like it'll be a little more serious than Chasing Jordan, but I up for that! Great review!